To sum up, Toxic People are individuals who cause a negative reaction or opinion through their attitudes and actions. Stereotypically, Toxic People are manipulators. They want to get what they want or feel better about themselves by any means possible. While that kind of toxic person personality does exist, there are other types too. 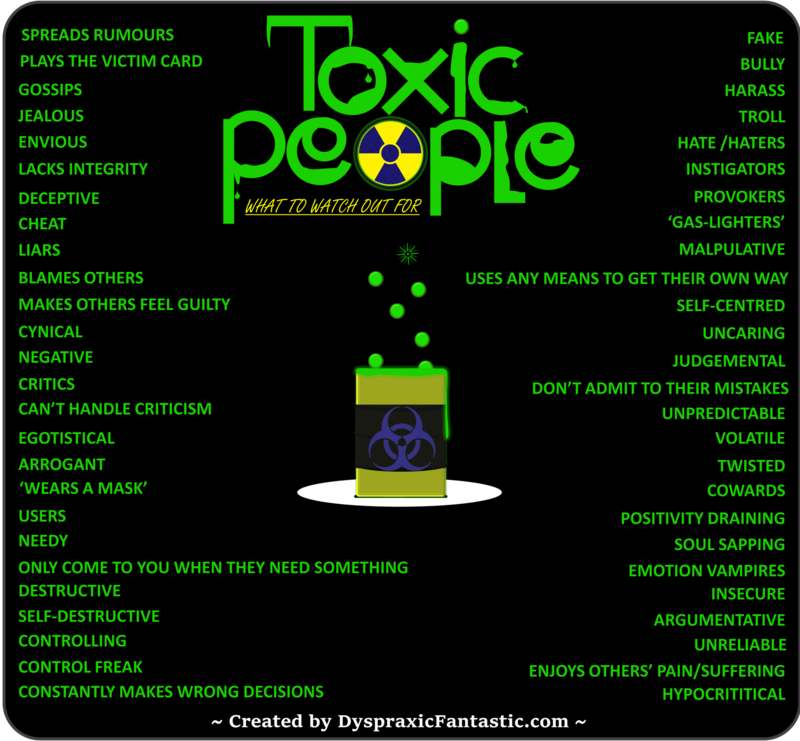 The following chart lists a selection of the type of traits that toxic people are known for. The list is by no means extensive and may not all apply at the same time, it’s just to give you a good understanding of this topic. 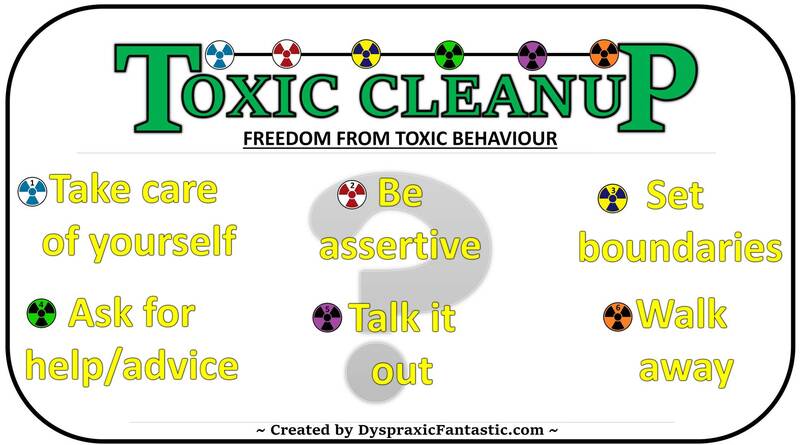 What are Toxic People and Toxic Behaviour? 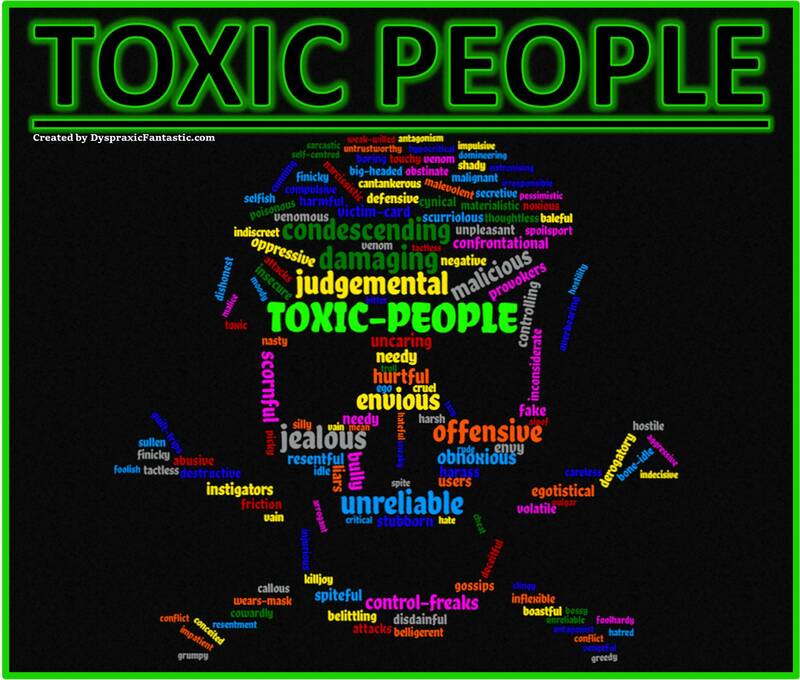 Much like how real life toxic waste degrades or eats away at materials over time, toxic people and their toxic ways can ebb or eat away at a person’s well being or emotional state. Toxic people are a type of bully but for the most part, they are people who are close to you. Examples of such people can be; a family member, a friend, partner, work colleague, etc. They can use wicked ways and tactics to get what they want or make themselves feel better regardless of how they make others feel. Toxic behaviour can start off small and gradually build up ~ It’s like with the suggested premise that frogs will jump straight out of a pot full of boiling water but if you put them in a pot of cool water and then slowly heat it up they’ll stay put and eventually cook to death. (This isn’t the case but it is a metaphor that fits how a lot of toxic people operate). Toxic people are not always directly ‘bad’ like some would offer gifts or something of a similar nature to gain trust first in order to start off a trail of manipulation or lure a person into a false sense of security. They can use these gifts later as a guilt trip or weapon at some point down the line, “Oh I gave you this/I did this for you so now you have to do something for me.” Of course, not all people who give gifts are toxic but it’s about understanding their intentions. In the broad sense, there are two categories of toxic people; intentional and unintentional. Both types can be equally as damaging but they do have their obvious differences. One knows they’re doing it but chooses not to change and the other doesn’t have a clue what they’re doing. Of course, once the ones who aren’t aware are made aware it’s then their choice whether they want to change or not. As mentioned above, there are different types of toxic people and while they can share certain behaviour traits the motivations and way they go about things can be different. In this chapter, I’ll go over a few of the different ones you can encounter. 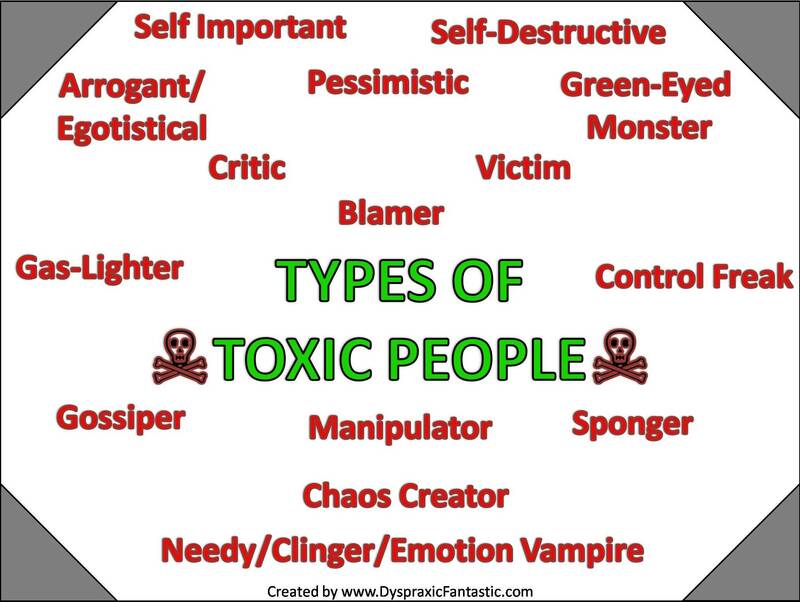 It is worth knowing that a toxic person may not fit into just one category and actually have two or more of the various types at the same time. Generally, these type of toxic people are underachievers, have more issues than the average person and/or feel inadequate/insecure about themselves. They create a false image to convince others and even themselves that they are perfect or better than they really are. Their self-image is constantly at threat so they do what they can to push others down or push themselves up in order to feel better – this bloated ego makes it difficult to be around them. They are often cocky who never learn from their mistakes ~ They never learn because they think they never make mistakes and are flawless. They’re not the most deadly of toxic people on this list, they’re just annoying and difficult to be around. Very similar in style to the arrogant type except these people don’t care what others think or feel of them because in their own mind they are perfect or even ‘a God/Goddess’. They believe their own opinion as fact and don’t care for anyone else. The people who are seen as of value are just to be used to make their self-esteem even higher. They tend to use people that are less attractive, less funny, more awkward in their opinion to make them feel more attractive, more funny, less awkward, etc. A kind of toxic variant which is similar to the self-absorbant person. To the green-eyed monster jealousy or envy fuels their toxic behaviour. They act on this impulse to degrade other peoples’ accomplishments and lives. Even the greatest of accomplishments the green-eyed monster would simply sneer at it as if it is meaningless. The jealousy and envy can be so bad that even when a green-eyed monster accomplishes something they have to overembellish/overexaggerate its worth in order for them to feel worthy in that accomplishment. Being around this kind of person makes it almost impossible to be proud of what you achieve as you know they’ll put a dampener on it. Eventually, you feel that you can’t even mention your success or stroke of good fortune to this kind of person as you know they’ll just devalue it. I’ve known the green-eyed monster to ‘copy’ other people’s actions, fashion sense, humour, etc. in order to try to ‘steal’ that person’s success or popularity. Some people are a magnet for trouble and can be at the receiving end of abuse or bad luck on a regular basis – which isn’t toxic behaviour, just unfortunate circumstance(s). It becomes toxic when The Victim enables their own trouble and/or keeps on falling into the same problems over and over again without learning from it. The Victim also denies responsibility for their problem and either shift the blame onto others or gets other people to sort their problem out for them. On top of that most toxic victims don’t bother to do anything to solve their problem and rather just complain about it. Some ‘Victims’ love when things go wrong because it’s an opportunity to gain attention. They’re the type who crave the comments of support from people like on Social Media sites along with likes/positive reactions. Rather than try out a solution they prefer to have a string of supportive comments. Many toxic people use the ‘Victim Card’ in order to get people on their side and to keep on being toxic. Any advice to help them is seen as an attack and they are quick to shut it down. A combination of the victim and manipulator as their focus is to shift the blame onto others for their problems. They deny that they are at fault and push that blame onto others. they are known for accusing people who confront them of playing the victim. They are difficult people as they hardly ever accept when things are their fault. The sponger feeds off the generosity of others without having any intent on giving anything back. In short, these people are lazy; they take the easy route and are not willing to go out of their way for anyone. If the Sponger owes anything then it can be a real battle to get what is owed back. By keeping on lending to them enables this toxic behaviour, at this point, it is wise to stop. Similar to the sponger except instead of money and materialistic things, it’s sponging off emotion and time instead. The Needy person comes to you only when they need something and no other reason. When life is going well for them they don’t care about anyone else and don’t bother with friends. As soon as things go wrong or start to go wrong that’s when they call upon those near them to sort out their problem. Similarly to The Victim they won’t confront their problems themselves and will just get others to sort out their problems. This kind of person seems to always get into some kind of trouble. The Self-Destructive person is a combination of ‘Needy’ and the ‘Victim’ where they cause their own problems and are after constant support. However, they will refuse to change and push any blame onto the one(s) helping them. Could be argued that some people with this kind of behaviour deliberately cause their own problems to get attention. This is one that’s been compared to the Dementor from J.K. Rowling’s Harry Potter Universe. To sum up, these people are extremely negative and find the cloud in every silver lining. They never take risks and are in a state of fear of things going wrong. They can also push these negative thoughts onto everyone. The glass is always half empty and that glass IS going to fall off the table – this bleak outlook puts a dampener on just about everything. Quite similar to the pessimistic person but they often more subtle with their negativity. They are more passive-aggressive in their approach, hiding behind sarcasm so it makes it difficult to understand what their true feelings or intent is. While sarcasm can be used for humour at times, the critic will be sarcastic to devalue others or make themselves feel better/superior. To the manipulator, other people are just pawns in their game of life. They can get close to someone by acting like a good friend but only to use this closeness to get what they want. It’s all about them to get what they want and they don’t care who they hurt. They’re the type of person to shift blame onto others when they’re intent is found out. They are horrible people who use whatever cunning and deceitful tactic to get others to do what they want. There are so many different ways of manipulation from subtle remarks to blackmail. The Manipulator is one of the most destructive toxic behaviours on this list. The two-faced friend is a prime example of this behaviour. The Gas-Lighter is a type of manipulator who plants false information and misdirection in order to warp someone’s perception of reality. In various versions of the story of ‘Rapunzel’ and ‘The Hunchback of Notre Dame’, the antagonists use gas-light manipulation on their ‘prisoners’ into convincing them about the outside world being a dreadful place so they stay put and do not attempt to escape. If they do escape then they get punished. The term dates back to the late 1930’s in the form of a play could ‘Gas Light’ which was made into a film in 1944 called ‘Gaslight’. The film is about a husband who manipulates his wife into thinking she’s gone mad. One way he did this was by switching lights off and on to make the gaslights flicker. When his wife asked him about the lights randomly going dim and then bright he would deny all knowledge and make out it’s all happening in her head. Much like the Goddess Eris (Greek Mythology) and the God Loki (Norse Mythology) these people live for strife, discord, and chaos. But they shouldn’t get flattered by being compared to ultimate powers because that never ends well for mortals. These type of people deliberately cause trouble for fun. This can be through gossiping, manipulation, pretending to be the victim, etc. Internet trolls are a great example of this type of toxic behaviour as they’ll say something they know will ‘trigger’ people and cause an argument or flame war. Much like a Rube Goldberg machine, one little nudge and then sit back, grab some popcorn and watch the chaos that ensues. These type of toxic people don’t mind being in the thick of it or watching from afar as all they care about is being part of or responsible for something chaotic. When an opportunity arises to cause a fight or argument then they cannot resist and will be the finger on the trigger. They are nothing but trouble and it is best to stay away from them or you’ll get caught in their next web of chaos. As rule #14 of the internet goes, if you feed the trolls you lose – so it is best to simply ignore them. The Hypocrite is full of double standards. and a typical behaviour trait is them saying one thing but doing something different. It makes it extremely difficult to understand what their true feelings are and there’s no way you can fully trust them. These types of people are also known for holding people back. For example, they talk negatively about certain choices to manipulate people into making a decision that best suits the Hypocrite. I knew someone who was in a rocky relationship with someone but would always speak badly about relationships and how all people of the opposite gender were all the same and not worth the hassle. This toxic behaviour was used in hopes to stop their friends from getting into what would be, potentially, a better relationship than what they had. This person was bitter and got jealous over the smallest of things. The Gossiper enjoys hearing and sharing other people’s misfortune or deepest secrets. It gives them a sense of power and a feeling of self-worth. They don’t care who they hurt or embarrass as being the centre of attention or gaining positivity off others’ negativity is all that they want and crave for. If caught they deny all knowledge and responsibility of what they did. The Control Freaks are people who use whatever means necessary in order to get their own way, mostly through manipulation or blackmail. They are stuck in their ways and do not listen to other peoples’ ideas as their own thoughts and idea(s) are what should be followed. When faced with adversity they bring up the same argument or even bring up irrelevant information in order to ‘win’ the argument/debate. One step further is they can use various dirty tactics like shouting, blackmail, emotions, etc. to get the final say or get what they want. If the control freak doesn’t get what they want then it can turn extremely toxic and sour. Attempting to convince control freaks to your way of thinking or finding the middle ground is a fruitless effort, purely because they’ll go to incredibly despicable lengths that you may never dream of going. Stooping down to their level isn’t a good idea as it’ll just end up creating a vicious cycle of toxic that’ll just get progressively worst. It is best to walk away. As unfortunate as it is there are plenty more types of Toxic People – mostly just slight variations of what I’ve outlined above – but you get a general idea. It is interesting to note that many traits and behaviours are actually normal behaviour but when it is absolutely overwhelming that it turns from natural behaviour into something toxic. There are many weapons and tactics that a toxic person can utilise to get what they want, boost themselves or push others down. While their weapons are not a secret they can be crafty to the point where you don’t even realise they’re actually being toxic. The metaphorical card is a statement used in an attempt to ‘win’ or silence an argument because they are losing it or are in a vulnerable position. The victim card can be used to shift the blame onto someone else, hide behind something (like a disability or event), or bring up something irrelevant to use as a weapon. It can be a statement that has nothing to do with the debate and is simply used to gain an upper hand. The card can also be used to gain allies in a fight or argument and make them feel empowered and win the argument by force rather than any logical reasoning. Some people wear a figurative mask. So basically they hide their true feelings, personality or thoughts behind another persona. For the most part, this is normal and many people do this, especially those suffering from anxiety or depression (smiling on the outside when it isn’t a true reflection of what’s inside, as an example). The toxic person takes it a big step further. They use a mask to manipulate people into doing their bidding or think a certain way of them. This can be making up a personality that the mask wearer will know will get the positive results they want. Like lying in an interview to get the job or acting out a persona to trick someone into being their friend or getting into a relationship. People who wear this kind of mask want to hide their true self away and while it can be justified in many instances it makes it difficult for people to trust them. Which is the real personality and which is the mask? Two-faced friends are exactly like this. I’m not sure what else to call it but there are toxic people who either lack self-confidence or who are just constantly pessimistic. Their behaviours, while intentional or not, can be emotionally draining. They tend to see the negative side of everything – every silver lining has a big dark cloud. They can’t be happy for anyone and any achievements they or others achieve they’ll always find a way to criticise it. It can be that they’re not happy and so they feel that no one should be happy. They then cause damage in order to make themselves feel better or bring everyone to their level so they’re don’t feel alone. It isn’t a simple task to stop the toxic and to be quite frank it is unlikely you can stop the toxic at all. Toxic People can be incredibly stubborn and not accept responsibility for their actions. Protecting yourself is the main priority and you must put yourself first. Taking care of yourself – This may sound selfish but by building up this kind of attitude you’ve started on the road to recovery as by putting yourself first it’ll be much more difficult to be manipulated or ‘hurt’ by the toxic. Be Assertive – This ties in with the Taking care of yourself but takes it one step further. Being passive or aggressive is a form of toxic behaviour to yourself and others. If you’re easy to take advantage of then this can enable the toxic person to take advantage of you. While I must insist that being manipulated isn’t a fault of the passive if there is a chance to step up and stop it from happening on their end that can only be seen as positive. Being aggressive can add fuel to the fire and make matters worst and it’ll give the Toxic Person a defence and can turn the aggression against you. Set boundaries – After gaining the confidence to look after yourself and being assertive then the next step is to set boundaries to stop the toxic behaviour. For example, if there’s a friend who is just after borrowing money all the time set the boundary that you will not lend any more cash out to them. Ask for help/advice – Having back-up is great for the confidence. It is also good to get the advice of trustworthy individuals just to keep you on track. Talk it out – Talking to the toxic person about how their actions are making you feel and what it is doing to the friendship/relationship is a positive way of making them aware of the issues you are having. If they do not realise that they are being toxic they can then take steps themselves to improve as a person. If they know they’re toxic then this is a good way of letting them know that you won’t stand for it anymore and it’s up to them what to do next. I recommend having back-up or letting people know you’re going to have a serious conversation with the toxic person just so they can give advise or support you. If the Toxic Person is notorious for getting extremely angry or violent then you’re going to have to make a good judgment call. Is it worth the risk? Can you get a few allies to help confront them the toxic person with you? Walk away – The toughest choice to make but it goes back to step 1; Take Care of Yourself. If someone is making your life an absolute misery or you’re just fed up with their attitude that they can’t be bothered to change then it is time to walk in the opposite direction. They say running away from your problems isn’t the answer but in this case, it really is. Some people cannot be reasoned with and you can give them chances after chance and warning after warning but if you don’t walk away then there’s hardly any point making such statements. There can be no guilt from looking after yourself and removing yourself from people who are full of toxic. Now, this is a section of Toxic People that is tough to write but it is important to note and it revolves around Depression. The fact of the matter is that depression is classed as toxic behaviour, but it is a type of toxic behaviour that is understandable and uncontrollable. The pessimism and whirlpool of emotions are exhausting for the individual, which goes without saying, but it can also have a big negative effect on others too. Helping someone with depression is an extremely credible thing to do and I have the highest respect for anyone who does that. Those people deserve the highest of praises because they’re putting themselves into the thick of it and are at risk to the effects of it. Isn’t that the measure of a true hero/heroine? It wouldn’t be honourable if there wasn’t a risk factor involved. So, while helping others is a great thing to do you must always put yourself first. If you’re helping someone but it ends up putting you in a difficult situation or is making you ill then you won’t be able to help them anymore and you’ll be suffering as a result. If helping others is causing overwhelming distress then you must find alternative means to help the individual out or walk away to concentrate on yourself. This could be getting extra support from other friends/family members to lighten the load or help them seek professional help. It is tough for me to suggest such a thing as I have been on both sides of this blight but it is the best way to be. I’ve had to deal with a few toxic people in the past. This has ranged from ‘friends’ who never understood the meaning of friendship to shady business representatives trying to sell something bogus. Toxic people are everywhere and dealing with it is a fact of life. That just leaves me to say a big thanks for reading this post as it’s been a complicated and lengthy one.